The way in which the different rocks of the Leeds area have responded to weathering and erosion has created the varied landscape of this region. The gritstones of the Millstone Grit are tough and erode slowly. The effects of weathering are concentrated along natural planes of weakness such as joints and major bedding planes. 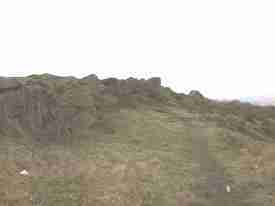 This is why the gritstones often stand out as prominent crags such as Otley Chevin and Caley Crags. The shales and mudstones that lie between the gritstones of the Millstone Grit are soft and erode more easily. The lower Wharfe Valley has been excavated in such rocks. 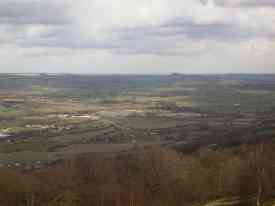 View across the lower Wharfe Valley. The valley is cut in shales; Almscliffe Crag, a gritstone outcrop, stands proud in the distance. To the north of Leeds the Millstone Grit strikes east-west and dips to the south. The different rates of erosion in the alternating layers of grits and shales have created a scarp and vale topography and is responsible for the switchback nature of many of the routes going north from Leeds. 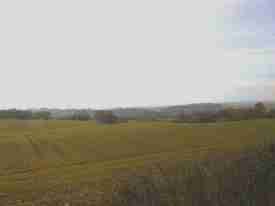 To the east of Leeds is a low plateau with a locally developed, west facing, scarp face. It is caused by the Magnesian Limestone which lies unconformably over Carboniferous rocks. The horizontal limestone is tougher than the gently folded Coal Measures rocks it rests on, and so erodes more slowly. As the scarp face has retreated it has left a number of isolated hills (outliers) capped by limestone.